It’s hard not playing favorites with the trees on campus; wouldn’t want to hurt their feelings, after all. But if we rank trees by the number of inquires, one of the most popular trees is the large (ok, very very large) Bur Oak by the Mahaney Center for the Arts, on the north side. Bur Oak, Quercus macrocarpa, is a native tree to the Champlain Valley, found in fertile wet clayplain forests. The common name comes from the fringed cups of the acorn, that resemble the burs on a chestnut. They are the largest of all the acorns. It’s safe to say that this tree is at the maximum height and width for a Bur Oak in Vermont. Age on a tree is too hard to tell without either cutting the tree down and counting rings (not happening), or using an expensive tool called an increment borer to pull a small plug out of the trunk. Oaks are difficult to tell apart without leaves, but they have the good grace to not drop all of them most winters. Some people can tell oaks apart by bark, but I don’t have the eye for that. The bark is deeply furrowed and very thick, fire resistant to withstand prairie fires in it’s native habitat. The leaves, however, are distinctive, with rounded lobes (like all in the white oak group, the red oak group has pointed lobes) and a very deep set of lobes in the bottom third of the leaf. 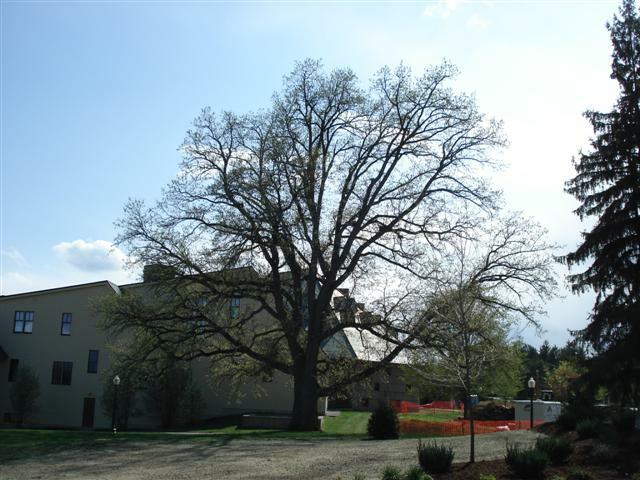 Swamp white oak, another popular oak on campus, lacks that deep lobe. Of course, the best way to tell the oaks apart is by acorn, and the fringed cup of the acorn on this species looks like a hat one of my girls would wear. This tree is probably a boundry tree, a tree left when the woods were cleared to mark the corner of the property. Bur oaks are solitary trees anyway, their extensive root system keeps other trees at bay. The classic pictures seen on t-shirts of the top of a tree, and the mirror image of the tree in the root system probably holds true in the case of a bur oak. A large but relativly short tap root plunges straight down, and then branches quickly and widely. Most trees have roots in only one real plane, while this tree has many at all layers of the soil horizon. It’s a prairie tree as well, and has developed this root system to compete with the deep rooted prairie grasses out west. Their are many other Bur Oaks on campus, one of our favorites is a memorial tree recently planted for Pavlo Levkiv in the driveway circle on the west side of Bicentennial Hall. Just imagine this large, spreading tree filling that space. In a couple hundred years, of course. P.S. Some of the information in this post was gleaned from two great books, “A Natural History of North American Trees” by Donald Culross Peattie, and “Trees of New England” by Charles Fergus.